I have made my fair share of mistakes when paying off debt. While I start off with the best of intentions, it is not easy and I have found several times that my initial plans did not always work. According to CNBC, eight in ten Americans are in debt right now. Debt is weighing heavily on many people’s minds. This year we were not prepared finically for the holidays and have racked up a little consumer debt. 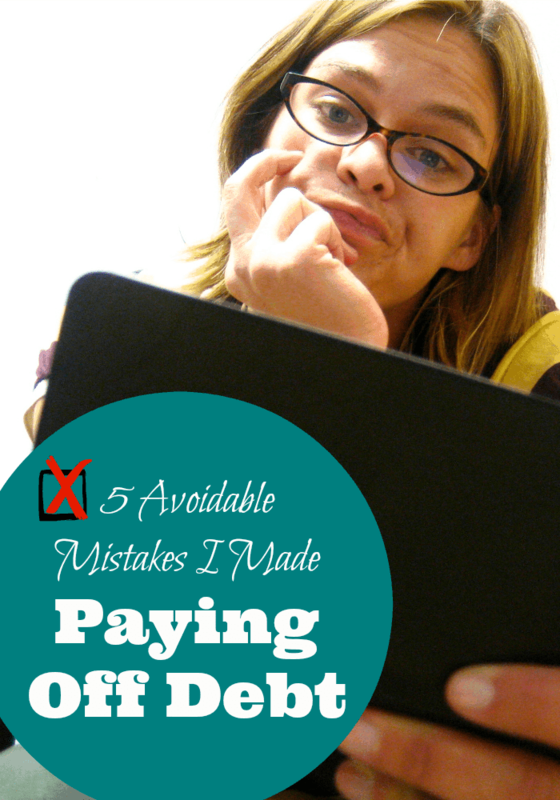 While I work on putting us back on track, I also want to avoid my past mistakes when paying off debt. Want to avoid my mistakes too? Check out my financial missteps bellow. Readers, have you made mistakes when repaying debt? Tell me about your challenges in the comments! Have you ever planned a road trip or vacation without mapping out your route? Not many of us would take that trip. Think of debt repayment as a journey, and you need a map. While people may change their minds, numbers are pretty cut and dry. Need help to get started? Organize your payments with this Free Debt Payoff Planner Printable at A Mom’s Take. Your tax refund, that extra twenty bucks you found in your coat or that birthday gift from your aunt, where did they go? If you find you do not know, you may need to rethink. If you use small windfalls to boost your debt payments, you will be free and clear much quicker. I also found that if I save gift cards for a special splurge rather than spending them right away, I can treat myself when I really want it without making more mistakes while paying off debt. Small purchases add up fast, but sometimes you need to rethink some of your daily purchases. One of my personal vices is the coffee shop line, which may not seem like much but $4 a day adds up to $112 a month just in coffee. Set yourself up for success and try to break some of your spending habits. Unsubscribe from that online store’s e-mails for a while, and turn off the app notifications for your favorite restaurant. Little lifestyle changes can help you reach your goals and also teach you How To Tame Household Debt. Keeping a small emergency fund for unexpected expenses is so important, and I have found the magic number to be $1000. If I can build my emergency fund up to $1000, I have found I can then easily handle life’s unexpected emergency such as the car needing a repair or the cat needing an emergency trip to the vet. (Both of which happened to me in the past month!) When I tried to repay my debts without saving up a small emergency fund, I found I regularly was off track within several months. Over the years, I have tried all sorts of tricks to spend less money. Where I run into trouble is when I purchase everything cheaply. Some items you simply need to purchase quality over cheapness. I purchase one pair of winter boots for my daughter per year. I look for sales on quality brands or purchase used from trusted friends rather than pick up a cheap pair at a discount store that may not make it through the season. These are excellent points. As a publisher of financial helplines, I see a steady return to credit card debt by consumers over the last few years. Its so easy to slip into debt, but seems like pulling teeth to bring it down. Something available but often overlooked are the numerous non-profit debt counseling centers in the community. They will contact all your creditors and negotiate reduced interest rates, so your payments have a greater effect on bringing down your debt. They also give great advice and teach you how to budget. As this comment is written on New Year’s eve, many will be making resolutions to pay down debt in the new year. Thanks for the article and the public service it provides. If anyone wants to learn more about Credit counseling, they can contact the Debt Relief Helpline at 888-790-1337.
yes a clear plan is necessary when paying down debt. if you don’t have one its not going to work. and i totally agree with changing your lifestyle. you can’t say pay down debt in the mall buying up a storm. great post! Wow, those mistakes are easy to make actually. I made an emergency fund before I actually started paying off debt. That helped a lot. Really wise advice!! Debt can bring us down. These are all valid points. :) thanks so much for bringing them to light. Thanks for the helpful tips. Debt can really bring you down especially if you don’t have a plan in mind. Wise and pithy advice for anyone who wants to dig out. I appreciated your tips!